Nanuet, NY, June 18, 2018 – Conflict Games is following up their wildly successful Combat Description Cards Kickstarter with a new campaign, this time focusing on depicting magic. The Magic Description Cards Kickstarter campaign proposes new ways to spice up magical attacks within pen-and-paper roleplaying games and fantasy fiction writing. In an effort to appeal to the broadest range of tabletop roleplaying games and situations, the Magic Description Cards are system neutral and gender neutral. The cards are organized in 15 suits, each corresponding to distinct “schools” or categories of magic such as Lightning, Frost, or Death. The adjectives and their examples are further broken up into three of the more common methods of distributing magic in tabletop RPGs: Area, Blast, and Touch. This proven design is reused from the previous Combat Description Cards Deck and allows for spot-on discovery of the perfect phrase. Conflict Games hopes the Magic Description Cards become a must-have tool for writers as well as tabletop gamers. They are a terrific tool to banish even the most stubborn case of writer’s block, inspiring and quickly bringing to a climax any chapter or battle scene. 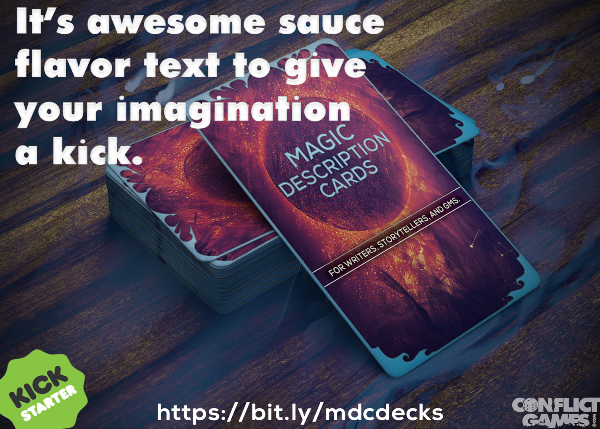 More than just a reference guide to magical descriptions, these cards unlock a proven, cost-effective way to save time and generate more ideas than any other fantasy adventure and historical fiction tool on the market. To make this card deck happen, Conflict Games has initiated a Kickstarter drive. The “Magic Description Cards Kickstarter” runs from June 29th to July 31st for an intended release in the second quarter of 2019. The project will be available worldwide. Funding gathered through Kickstarter will go toward writing, printing, delivery, and distribution of the cards. To view a PDF sample of the cards, you will find a one-sheet, print-and-play version on the Kickstarter campaign page.